Here is a side dish I made last night by scrounging through leftover bits I’d saved during the week. 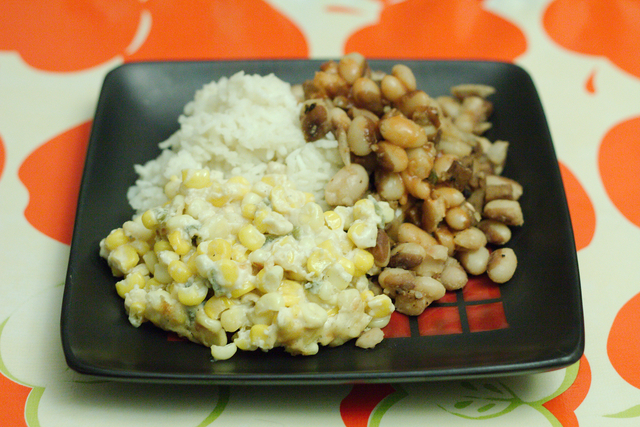 It was a nice accompaniment to the rice and beans I also made and Mark absolutely loved it. 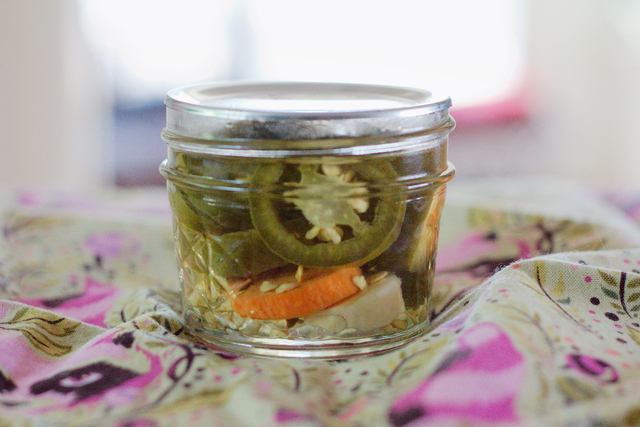 I made ours quite spicy but you can make it as mild or as spicy as you like by varying the amount of jalapenos. Note: Since buying the phenomenal Vegan Artisan Cheese, all of my cheese sauces have been made by melting a hunk of pretty much any of the cheeses from that book, generally by whisking water off the boil into it, then whisking in nutritional yeast flakes, garlic and or onion granules, and sometimes fresh lemon juice, and they’ve all blown away any cheese sauces I’ve made in the past. I had half a cup or so of such a sauce left over from serving over steamed cauliflower the other night, although I can’t explain why because I can eat that stuff straight! If you don’t have Vegan Artisan Cheese, first of all, get it, but if you don’t have time to buy the book, make the rejuvelac, and ferment the cheese, use your favorite “cheesy” sauce. The recipe for an old standby is available here. A note on the pickled jalapenos: I linked to a refrigerator pickle version of pickled jalapenos that I’ve made in the past, but since I discovered and fell in love with canning this summer, I bought a ton of jalapenos at the farmers market, sliced them, and put them in 4-oz canning jars (which I find adorable), along with a couple sliced of carrots and a smashed garlic clove for each jar. Then I poured a hot brine of 50% white or cider vinegar/50% water and some salt into each jar, leaving 1/2″ headspace, and processed in a hot water bath for 5 minutes. I love this size jar for stuff like this and I have plenty of them to last me through the winter. I also love the spicy, vinegary brine – I mix it with tomato sauce and a few other ingredients to make a nearly instant taco sauce. Hmm, perhaps I should do a separate post on all this stuff? Preheat the oven to 400 degrees Fahrenheit. If you can fit your baking dish into your toaster oven, you can use that (I did). In a bowl, whisk together the “cheese” sauce, sour cream, and jalapeno “juice” (if using). 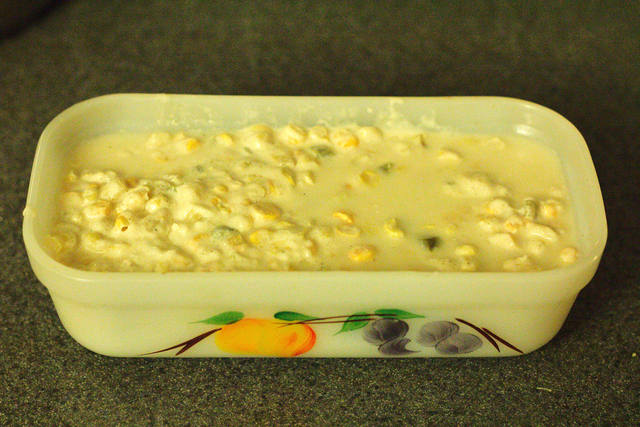 Stir in the jalapenos and corn. 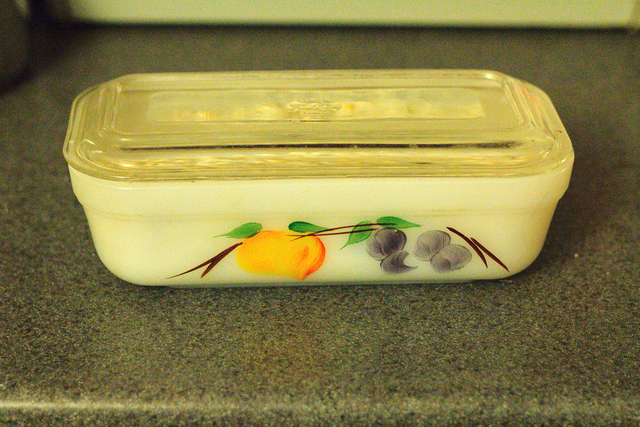 Transfer to a small baking dish (I used a glass loaf pan). The mixture should be just a little liquidy; if it’s not, add a little water or non-dairy milk. Remove the cover and bake uncovered for 20 more minute or until brown and bubbly. I served this with rice and beans. The beans are Steubens yellow eye beans, which Whole Foods sells in their bulk bins and which I adore. I think they are my favorite bean; they are very tasty and so pretty! I soaked the beans for a few hours then put in my slow cooker with some liquid smoke and minced onion and garlic in some broth and cooked on high for maybe an hour and a half. Then I drained the extra broth off. I had a few slices of leftover seitan, which I chopped pretty small and fried until crispy in a cast iron skillet. I added some vegan bacon salt and onion granules to it as well as several healthy squirts of liquid smoke. Then I added this “bacony” seitan to the beans, as well as some sliced fresh jalapenos, and warmed it all up. 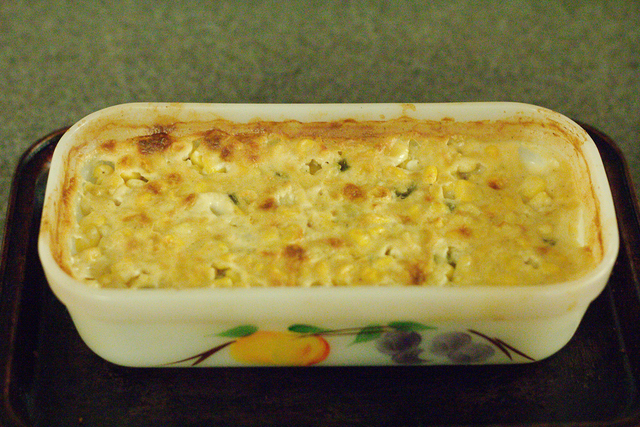 This was topped generously with Tabasco and served over rice with the corn jalapeno casserole accompanying it. 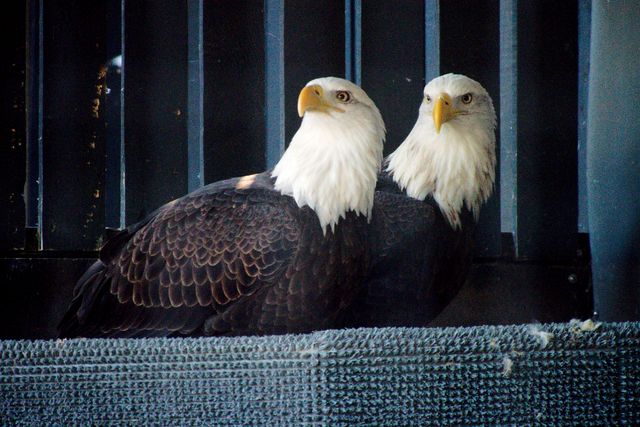 My only raptor volunteering regret is that the Raptor Conservancy of Virginia isn’t a big enough facility to house eagles, except very young ones. We have to transfer any we get to the Wildlife Center of Virginia. This is an eagle owl; I forget what kind. Eagle owls are all pretty huge though. 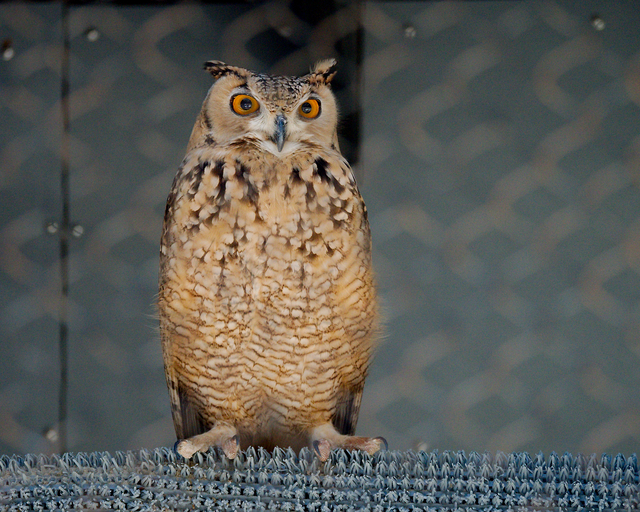 We have a Eurasian eagle owl (as did the Center for Birds of Prey) at the Raptor Conservancy and it’s enormous. 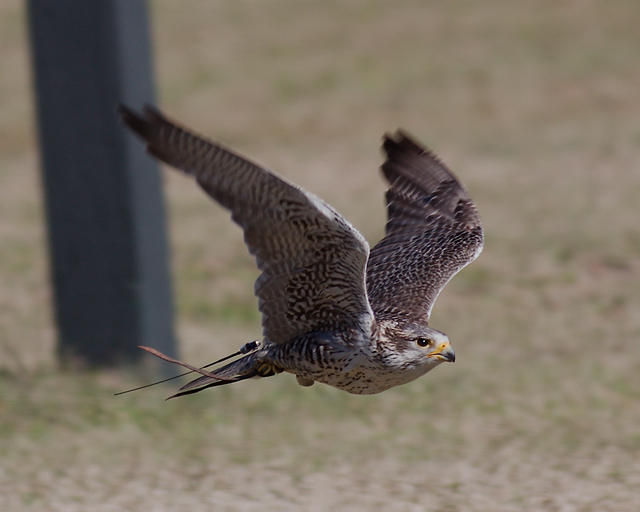 The rest of the pictures are all from the flight demonstration. 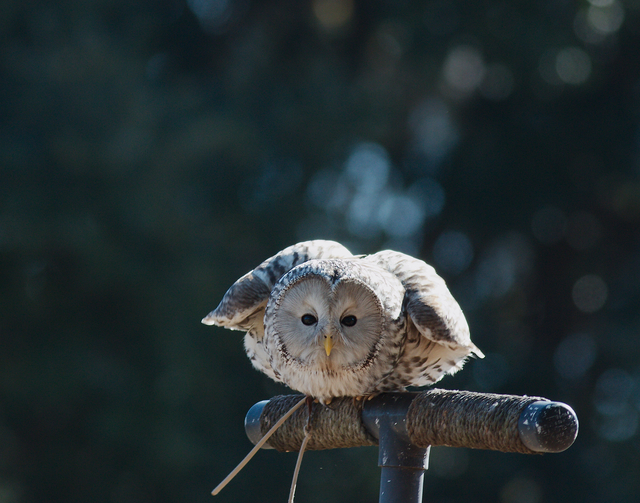 How adorable is this Ural owl? You can see his jesses dangling from the perch. Education birds will usually have leather jesses around their legs. 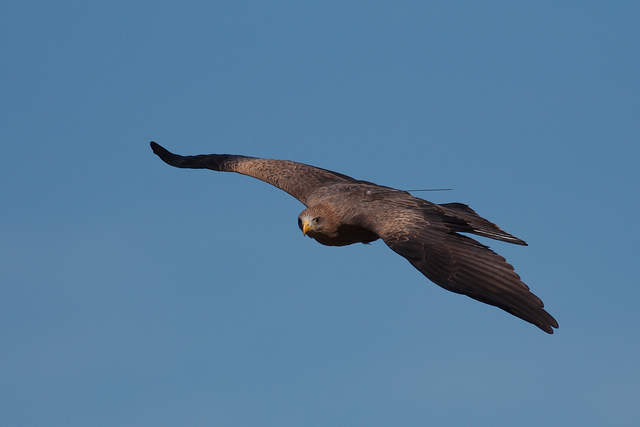 This is what handlers grab onto with their gloves when holding these birds (I know because I get to do this!). When you aren’t doing a flight demonstration (which is not something we do at the Raptor Conservancy), the jesses are attached to a lead whenever the bird is out of its cage. 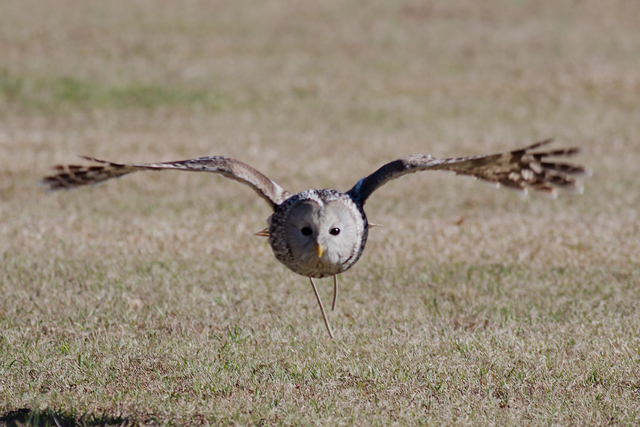 Because owls are nocturnal, most people very rarely get to see them fly, which is a shame because owls in flight are really amazing. For one thing, they are totally silent. I never really expected to see a vulture in a flight demonstration, but they had one! This one is for Jes. Did you know that there is controversy over where to classify New World vultures (like this black vulture) in the animal kingdom? They used to be linked to falcons but genetic testing in the last 20 years or so put them closer to storks. 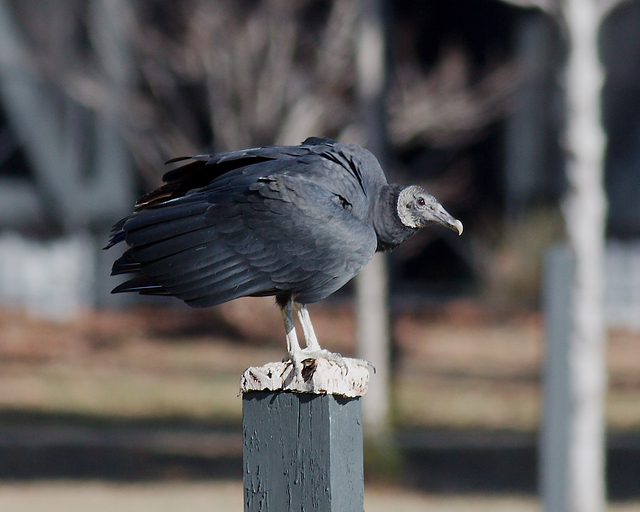 We don’t admit vultures at the Raptor Conservancy. The Center for Birds of Prey, on the other hand, is way into vultures: the bulk of the “tour” was letting us watch them feed the local wild vultures with the scraps their patients refused to eat. 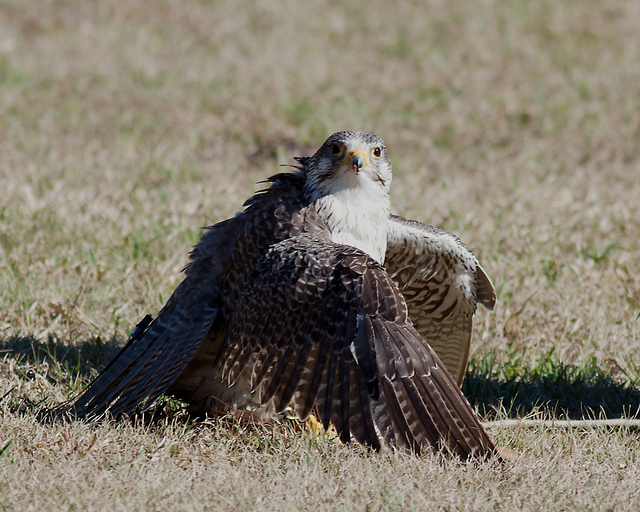 Here the falcon is on the ground hiding his “prey” of ground beef behind his wings. 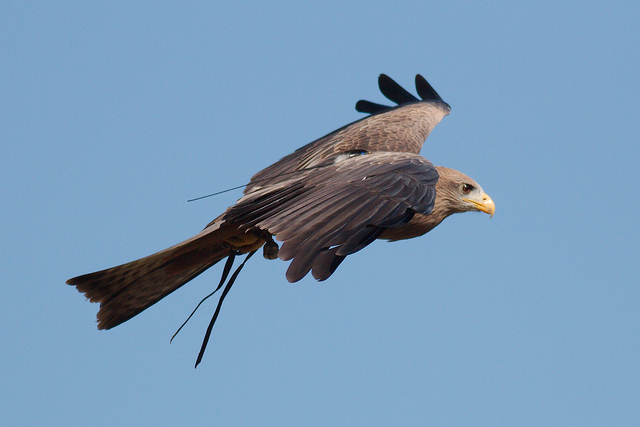 Kites seem to be lesser known raptors, at least in this area, but they are neat birds. 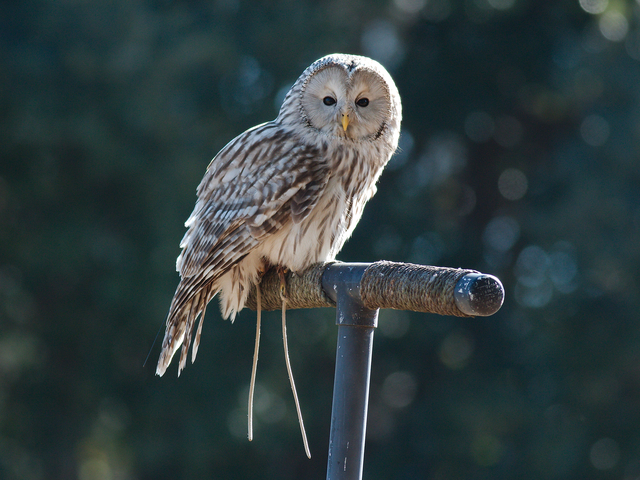 We don’t have any at the raptor center right now and I don’t think we see too many. But they are fun to watch fly and this guy was clearly loving the opportunity to soar around for a bit on this very clear, beautiful day. I have yet more raptor pics – we saw a few wild raptors at various parks while we were in Charleston, but I shall save those for another day. My favorite stand at the farmers market always has cippollini onions with a sign next to them saying, “these are great roasted!” and every single week I’m suckered into buying them by that sign because I LOVE roasted onions. I made this with potatoes last night, but I wish I’d tossed a couple of chopped carrots in there as well because roasted carrots are also totally awesome and my plate would have been that much more colorful. Preheat the oven to 375 degrees Fahrenheit. Put the onions and chopped vegetables in a pot and just cover with water. Bring to a boil and cook for about 3 minutes, then drain and rinse under cold water until cool enough to touch. Place on a pan or in a cooking dish large enough to arrange in a single layer and drizzle with olive oil (about a tablespoon or so) and about a tablespoon of the white balsamic, using your hands to coat every piece. Sprinkle with the rosemary and salt. Cover the pan or dish with aluminum foil and roast for half an hour. Remove the foil and return to the oven for another 20 minutes or until the vegetables are all soft. Drizzle with additional basalmic if so desired. 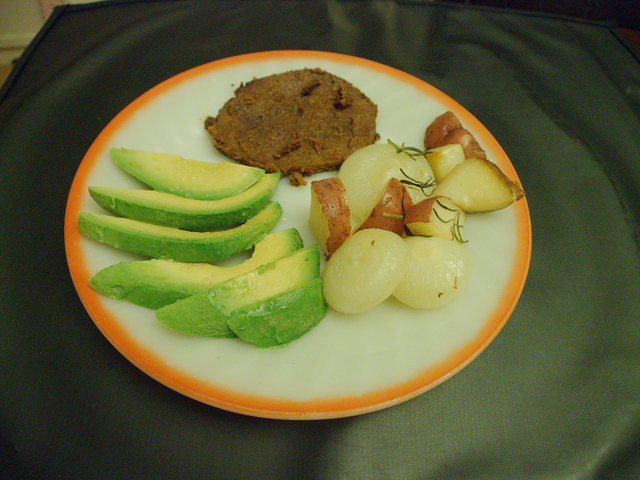 The brown blob on my plate is barbecued seitan, using a riff on Vegan Dad’s lunch meat. YES, I AM OBSESSED WITH AVOCADOS. I don’t know about where you live, but the weather in Northern Virginia has been GLORIOUS. I finally got around to getting an annual pass for Occoquan Bay National Wildlife Refuge (there is normally a $2 honor system entrance fee) since I’m there all the time. I was very easily talked into joining the Friends of the Potomac River Refuges, which meant I paid $15 for a membership and got $5 off my annual pass, meaning I spent $10 more than planned in order to earn the privilege of doing things like picking up trash! I josh. Although really that’s one of the things I get to do as a “friend” of the refuges (Occoquan Bay is one of three refuges in a complex of three within a few miles of each other, although currently one of them is only accessible by kayak). I must be very easy to read because the volunteer making the sale remarked that as a “friend” I’d have occasional access to areas not open to the public (which, honestly, is about 80% of the refuge, and I’d give myself about a 4 out of 10 on ability to obey those rules). And really I do want to get more involved with the refuges so had I known about the organization, I’d have joined a long time ago. I want to do things like count species for them. ANYWAY, the weather’s been about a 12 out of 10 all week and it’s the last few days I’ll be able to get into the refuge past 5 p.m., so Wednesday night I was down there again tromping around. 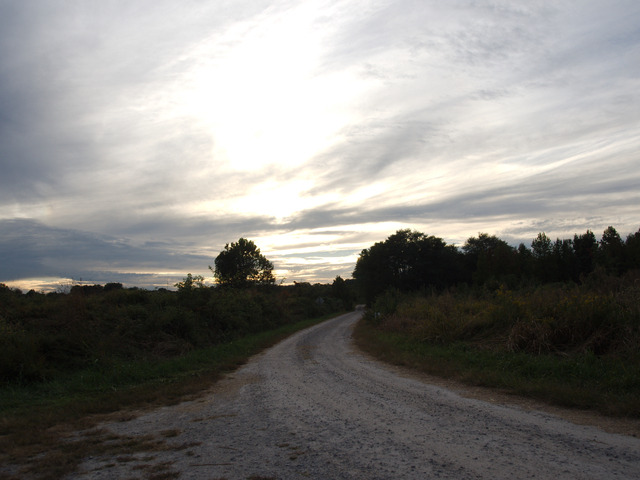 This is the entrance road. 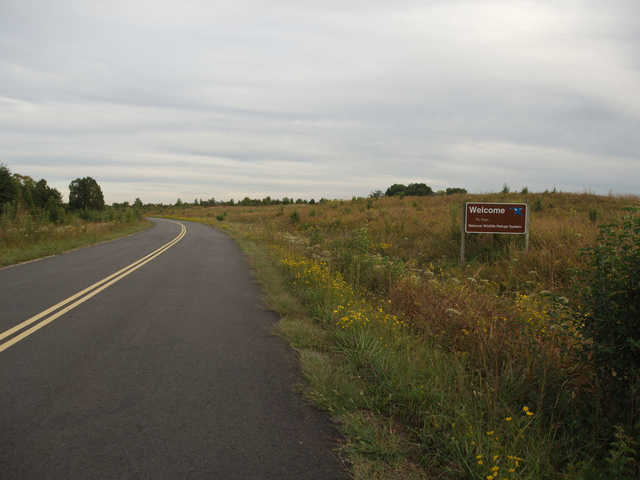 The main parking lot is in the middle of the refuge so I’m headed there. The sign says, “Welcome to Your National Wildlife Refuge System,” which always makes me think MINE MINE MINE! I’m not really sure where the boundaries of the different water bodies are, but this is probably right about where Belmont and Occoquan Bays merge. 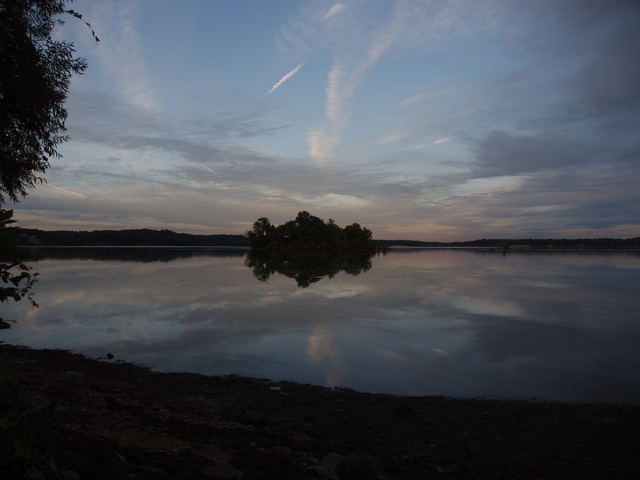 OBNWR is located at the intersection of the Occoquan and Potomac Rivers. I’ll be honest, one of the main reasons I want to be at OBNWR around sunset is because I REALLY want a good picture of a fox and sunset or sunrise will be my best bet. And I see one maybe one out of every three times I go around sunset. But I NEVER get the picture. THEY ARE SO QUICK! (And always jumping over lazy dogs!) It started getting dark fast after I took those sunset pics over the bay(s), so I had to trot back rather quickly to my car, which as I said was parked in the middle of the refuge. 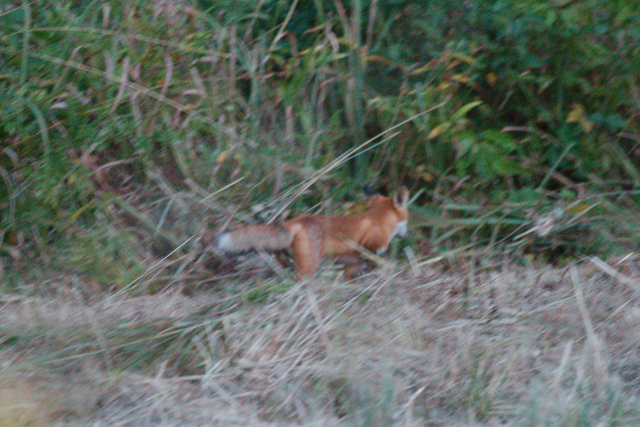 So I was trot trot trotting, turned a corner, and found myself face to face with a beautiful red fox, startling both of us. He was actually too close to me! Too close for my 400mm lens to focus on him! Damn it! Here he is running away from me! Hair stylist: How often do you wash your hair? Hair stylist: What do you wash it with? Me: Some handmade shampoo bar I got from etsy. Hair stylist: What styling products do you use? Me: The gel I scrape from inside the leaves of my aloe plant. I mean, to me, all that sounds perfectly normal. Everything I do seems very normal. But even *I* walked away from that conversation thinking I might be a goddamn hippie. In discussing what sort of cut I wanted, he asked what styling methods I use and I had to confess that the only hair dryer I own is my convertible car. He did his best not to look mortified, but he did suggest about five times that I try switching to a volumizing shampoo. His parting words to me were: “VOLUMIZING MOUSSE!”. Well, that was probably TMI, so I’m going to go now and don some love beads, switch on the black light, burn some incense, douse myself in patchouli (crap, I have a bar of patchouli soap in my shower; if I wanted to avoid this hippie label I’m not faring very well here), crank up In-A-Gadda-Da-Vida (hmm, not only do I own In-A-Gadda-Da-Vida, probably half of my music is from the ’60s – it’s getting harder to run from this label), drop some acid, and ruminate on how the man is bringing me down. 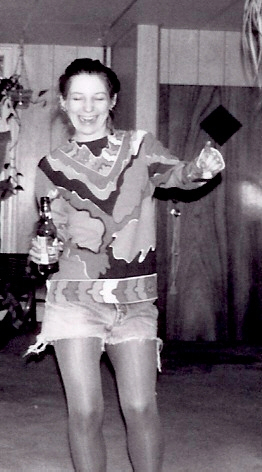 I don’t know if this picture makes me a hippie but it is one of the more normal outfits I wore in college. It probably just makes me weird. You don’t have to be strange to be strange. You don’t have to be weird to be weird. Edited to add: I just learned that Mark E. Smith is on twitter and his tweets are just about what I expected, which is to say, hilarious. I don’t know why I turn into a Brit or Australian when referring to the product Americans call ground beef (or ground pork, or ground whatever), but I do. … and then scoop the seeds out. For this dish, and most others unless you are stuffing it, you’ll then slice it into half-circles and optionally chop it. It cooks in about the same time squash does and has a similar texture. It’s not at all like a melon, but it is very, VERY bitter. Also, Mark insists it looks like squid tentacles. I tend to fall into raptures over any new vegetable I come across, but bitter melon is going to have to do some serious work to win me over. I tasted a very small bit before cooking it and quickly realized I’d better make Backup Dinner in addition to Experimental Dinner, so I chopped a red bell pepper and a head of broccoli. I used an entire 14-oz package of Tofurky mince, but used maybe a third of it with the bitter melon, which is why I called for 4 oz above. I also only used a third of the sauce in the bitter melon dish (although I did NOT adjust the measurements above for the sauce). I used the remainder of the mince and the sauce to make a broccoli/pepper/mince stir fry. I’m going to power on and give you the recipe, though, because you might like bitter melon more than I do (although I do not recommend you invite a bunch of people over and serve them a main dish of bitter melon without knowing what it tastes like). Put the mince in a bowl and add the ginger and half the Shaoxing wine. Shaoxing wine, by the way, is Chinese rice wine. You can sub sake or dry sherry. Mix everything together, then set aside. Fetch your fermented black beans. Now this is a staple you should keep on hand. They often come in a paste-like consistency, in a jar, but you can also buy them dried, which is what I usually do because they keep longer that way. Measure them out and put them in a small bowl. Add the rest of the Shaoxing wine, garlic, soy sauce, sugar, chili paste, and black vinegar. Heat some oil in a wok or skillet over medium high heat, then add the bitter melon. Stir fry for a minute or two, then add the mince. Stir fry until the bitter melon is soft, about 5 minutes. Add the sauce and combine well. Here it is with the backup dinner I fortunately made. I actually ate nearly all of the bitter melon dish, so I guess I didn’t detest it, but I don’t think I’m going to rush up to bitter melons at the farmers market with the unadulterated glee with which I attack, say, romanesco. I think Mark put 1 mm of bitter melon (a.k.a. squid tentacle) on his tongue, spit it out, and that was the end of bitter melon for him. However, the sauce is good and Mark really enjoyed Backup Dinner. He informed me it had a “good taste,” which he “assumed [I] was going for.” I agreed: yes, I usually do go for “good taste” when cooking. It turns out “good taste” to Mark means “complex, with different layers of flavor.” In this meal, Mark tasted salty, sweet, spicy, and … bitter. It took him a while to come up with the word “bitter”, but I thought it was interesting because I never told him the squid tentacles were really called “bitter melon” because I knew there was no way in hell he’d eat something called “bitter melon”. Yet he was gushing about how much he loves “bitter tastes”, even though “most people don’t”. SO HE SHOULD HAVE LOVED THE BITTER MELON, NO? Anyway, in conclusion, bitter melon is very … interesting. 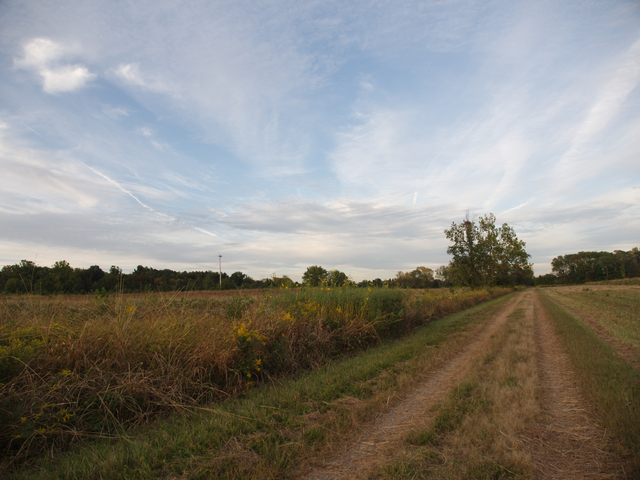 In other news, today was largely a day of photography, and it follows that you will be subjected to pictures. 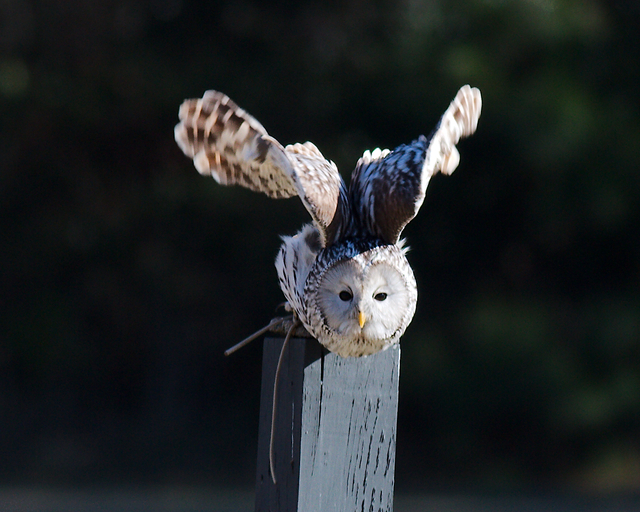 No animals today; I didn’t get any good animals shots at the wildlife refuge this morning. But Great Falls, on the Potomac, was looking mighty spectacular today. I narrowly avoided a storm, but was rewarded with great light. 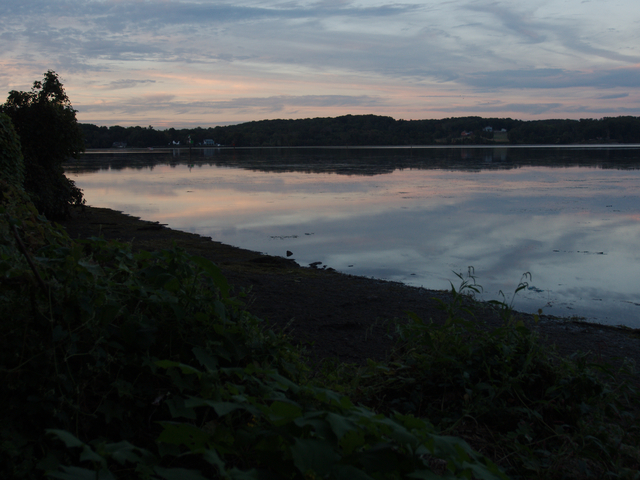 These look much better in high-res, so if you are so inclined, you can click on them for the full-size version. So, my grandmother passed away on June 7. I didn’t mention it earlier because I was trying to think of a good food-related tribute to her. The problem is, although she liked to cook when I was younger and I always looked forward to special treats like roast beef when we visited (yes, I liked meat when I was little; I liked everything), it’s been really hot here and I just haven’t been in the mood to make some spectacular seitan roast. But then I realized that seitan roast wasn’t really the right thing anyway. The one food that always makes me think of Grandmother is butternut squash. I lived with Grandmother for my first two years of college because her house was much closer to campus than the parental homestead. Honestly, it wasn’t a great arrangement: I was too wild for her and she was too restrictive for me. I think everyone was a lot happier when I moved into an apartment with a friend. But there were some high points in there. For example, although she’d never really had to cook regularly for a vegetarian before that time, she never once hassled me about my diet and instead went out of her way to buy me fresh vegetables and when she found things she hadn’t used before, she learned how to cook them, just for me. In particular I recall that the first time I ever had butternut squash was when she cut one in half, roasted it, and topped it with butter and a little brown sugar. I loved it! I remember, for some reason – it’s a weird thing to remember, once looking at my fingernails and noticing they looked really good and thinking to myself, “wow, I look and feel so healthy; it must be all the fresh food Grandmother is making me.” I don’t know how true that is, considering I just as often stuffed my face with pizza, french fries, and beer like any other college student, but now that I think back on it, the time I spent living with her was probably the first time I started thinking about vegetarianism from a health standpoint, and the first time I felt healthy effects from it. I never buy a butternut squash without thinking of Grandmother, and I almost always make it the same way she made it for me. Unfortunately, butternut squash is not in season and there are none to be had. But I made something for dinner the other night that I thought was in the same spirit of things and probably similar to a dish Grandmother made for me when I lived with her. It might not be a recipe I got from her (and once she discovered the internet, she did email me tons of vegan recipes she found online), but I think it’s something she’d be happy enough to be remembered by. Globe zucchini are a farmers market favorite and are ideal for stuffing with stuff. Another reason this meal had a grandmotherly feel to it was it was very frugal, and having lived through the Depression, Grandmother was a fairly frugal person. It took me no time at all to assemble because the rice and sausage were left over from the night before and the spaghetti sauce was part of a small bit I found in my freezer, which I removed to make room for a large May Wah shipment I ordered on a whim when they sent me an email about a sale. So to make the filling all I did was mix everything together with the chopped insides of the zucchini. But I’ll describe the steps as if I were making it from scratch. Heat a small bit of oil in a skillet and brown the sausage and onion. Add the garlic and cook another minute or two, then stir in the rice and cook another minute or so. Finally, stir in the spaghetti sauce. Set aside. Slice the top off each zucchini, then use a knife or a serrated grapefruit spoon to scoop out the insides, leaving a medium-thick wall all around. Chop up the “guts” you removed and add about half of it to the rice mixture. (You can save the other half for another use.) Spoon some of the rice mixture into each zucchini, trying to compact it a little bit. You can mound it up a bit as well. Bake for about 45 minutes, then remove and let sit for 5 minutes before serving. I baked mine in the toaster oven, which was a perfect fit and didn’t heat up the kitchen. Since the tops of the zucchinis were so close to the top of the toaster oven, though, I covered them lightly with aluminum foil to prevent scorching. I served it with a couple of vegan “drumsticks”, just because the May Wah shipment had arrived and I figured I’d better get started on eating it. I asked my mother to send me some pictures of me and Grandmother together. She sent me a bunch but I liked this one because Grandmother has a cat on her lap. My love of cats was directly inherited from my mother, who inherited it from her mother. That side of the family has always grown up with cats, and in particular, Siamese cats. (Which I think Jes will like.) The handsome man is my grandfather, whom I called Bobby in imitation of my Grandmother (toddler Renae liked the sound of the word “Bobby”), and who died way too young. I was struck that almost half of the pictures Mom sent were pictures of Grandmother reading to a little Renae. I’m pretty sure I’m wearing a totally awesome kitten shirt in this picture. No wonder I’m a bookworm! Another thing that stands out about my grandmother is she was always on the forefront of new technology. She was the first person I knew to get cable television and we’d all crowd around her set and watch MTV when it was in its infancy. I’m not old enough that electric typewriters were a “new technology”, but I had a weird typing obsession as a kid so she taught me how to touch type and bought me an electric typewriter. Because I was the type of child who asked for a typewriter. While we had a standard Atari game console, Grandmother had an Atari computer. I was online before just about everyone I knew, but my grandmother’s was probably the second or third email address I ever sent email to. One thing she didn’t seem to believe in was a paperless society, because she has binders full of printouts of every single web page I’ve ever had, most of which are just embarrassing. I was flipping through one such binder one of the last times I was at her house and she had printed out a review I wrote of Aleister Crowley’s Diary of a Drug Fiend. It was a very negative review – more of a rant, really – but still I was wondering why in the world she’d want to read, let alone print out and preserve for posterity, such a thing. The reason is, her granddaughter wrote it; that’s the only reason she needed. Anyway, what I’m trying to say is she was a very progressive lady in her way. Definitely not a technophobe like some members of generations older than mine (I’m looking at you, Dad!). Rest in peace, Grandmother. Thanks for reading to me, teaching me to type, letting me play your video games, watching MTV with me, taking me on trips to look at tiny ponies, tolerating (to some extent) me living with you, feeding me, introducing me to butternut squash and a myriad of fresh vegetables, reading my websites, sending me email, and the very Grandmother-like binder I have full of vegan recipes you found online and emailed me after I told you I’d gone vegan and what that meant. Many of those recipes were the very first vegan dishes I ever cooked, in fact, the first real cooking I did. So there’s a little of you in I Eat Food. There aren’t any new farmers this year but the market seems better than last year; the farmers seem to have a wider variety of vegetables. Which is so very welcome, because believe me, after attending the farmers market in Nice, I was bracing for a big letdown once I got home and went to my own market, even if I had been missing it dearly all winter. … then I roasted it at 350 degrees Fahrenheit for a while – maybe half an hour? Until it was done. The magenta coloring on some stalks is from the lemon juice. … and processed until smooth. I took some whole baby potatoes (also from the farmers market) and boiled them for about 5 minutes, then drained the water and banged them around in the pan a bit (a tip I read in another blog somewhere but I don’t remember where), then put them in a baker and drizzled with a bit of olive oil and baked at 350 degrees Fahrenheit for about 15 minutes. Then I took them out and stirred in some of the pesto, then returned them to the oven and baked another 10 minutes or so. I served both with a rice and lentil pilaf, into which I stirred leftover pizza toppings from the night before, which included spinach, caramelized onions, and garlicky sun-dried tomatoes (which I’d made as a take on some amazing sun-dried tomatoes we bought in Nice. I got more garlic scapes at the market this weekend – not one but two vendors were selling them! What are your favorite ways of using them? I’d love to hear. I’m thinking about pickling some. Now, Nice Nice Nice. Nice is soooo nice. After a week in Paris, we hopped on a train to Nice, on which we met up with Brad and April, who you’ll recognize as our fabulous hosts in Amsterdam from prior posts and who had come to join us in splendid Nice. Situated in the French Riviera and very close to Italy, Nice has a huge Italian influence. As it’s right on the Mediterranean Sea, many of the restaurants predominately feature seafood. Neither seafood restaurants nor traditional French restaurants cater very well to vegans, but the good news is the heavy Italian influence means pasta abounds, and every Nicean restaurant we visited had a vegan pasta-and-tomato-sauce dish. Mark and I ate a lot of pasta in Nice, to the point of getting a little tired of it, although somehow we managed to go to various restaurants in such an order that the pasta-and-tomato-sauce dish in each one was better than the last, which helped. Our first night we unloaded our bags in our terrible hotel, then walked to the boardwalk and wandered until we found a reasonably priced beachfront restaurant with outdoor seating and a pasta alla pomodoro on the menu. This was easy to find. After a long day of travel, with a bottle of wine, this simple meal was just right. I’m a terrible food blogger and didn’t manage to record the names of any of the restaurants we visited in Nice…although you’ll find similar dishes anywhere you stop. Another dinner was in old town Nice (Vieux Nice), in one of the restaurants that turns the tents for the daily market into outdoor seating in the evening. Mark got the linguine with vegetables, which was really good. And I got the risotto, which was made with olive oil and no cheese, to my surprise! It had mushrooms in it, which I hate, but they were easy enough to eat around and I was just so happy to be able to order risotto that I didn’t care. In fact, on very rare occasions, I am able to eat mushrooms without gagging, and I believe this risotto may have been one of those exceptions. We found ourselves in Monaco one day (it’s strange how these things happen over there; you wander off and suddenly you’re in another country), where food seemed to be a bit limited, but soon another Italianesque restaurant saved the day and Mark and I got penne all’arribiata, which was surprisingly delicious. Well, I always think penne all’arribiata is delicious, but I was surprised by how delicious I found it after eating Italian food for several days in a row. Love the huge branch of rosemary it came with! Brad and April had pizza in Monaco (you can see a bit of April’s in the picture above, and in fact, if you look really hard, you can see a bit of Carrie the poodle as well!) and I’ll be honest, I was quite jealous. It’s rare I’ll look enviously at someone’s non-vegan meal because meat and – it’s true – cheese gross me out. But pizza done right (I’m not talking about Dominos pizza, but GOOD pizza) is something I will covet. So the next day in Eze (oh, beautiful, beautiful Eze), when we stopped for lunch in a lovely outdoor cafe at the top of the hill, amongst the medieval ruins, I worked up the nerve to ask the waiter if it was at all possible to get the roasted vegetable pizza without the cheese, and guess what! He didn’t think it was a crazy request at all! He just said “certainly!” I would have preferred a “real” pizza crust (this was one kinda crunchy like toast), but IT WAS PIZZA AND IT WAS GLORIOUS. I accompanied my pizza with a panache, which is apparently the French version of what I would call a shandy: lemonade + beer, where lemonade = Sprite-like beverage, as in British-English, not American lemonade. Refreshing! … and sauteed noodles with legumes. We also went to an Indian restaurant, which was quite good, but the pictures I took were blurry, probably because I was exhausted and starving at the time. But just know you’ll do fine as a vegan in Nice. You might have to pass more restaurants by than you would in, say, L.A., but there are plenty of options. It might be harder to be vegan AND gluten-free as a lot of those options are pasta-related, but I think gluten-free in general is probably harder in much of Europe than it is here in the States. Nice and Eze were so incredibly beautiful I am going to have to do a final vacation post with a few breath-taking photos later this week, but I’ll finish up this food-related post with a bit about the market, and a traditional Nice snack that is – believe it or not! – vegan. The views were enough to make me want to move to Nice, but attending the market was what really put me over the edge. The open air market operates all morning six days a week (on Monday it is replaced with a flea market), in the old section of the city. At one end, there are many stalls with flowers, although their perfumes were a bit overwhelming and drove poor Mark out. Then you come to several stalls selling dried lavender in just about any form you can imagine, soaps, and some touristy-type things. Then there are a couple of stalls with an amazing array of bulk spices. This is a stall full of dried peppers and other chile-related products. Finally you get to the produce. It’s all gorgeous. We bought some cherries and wandered around the market eating them and I’m pretty sure they were the best cherries I’ve ever had. Nestled amongst the produce stalls is a socca station, where a socca-making lady is kept extremely busy. Socca is a Nice specialty made from chickpea flour and it’s generally vegan. I had to stand in line for quite some time to get some at the market (though the market is not the only place to get it). From my place in line, I watched a couple of batches being made. The final portion of this batch was sold before it was my turn. Fortunately, she whisked up another batch and poured it onto the large cooking tray (under which there is a fire), then drizzled it with olive oil. When it was finally my turn, I ordered the last three pieces from the batch above, to share with Mark, Brad, and April. Before being cut up, it was sprinkled with ground black pepper, which, combined with the texture, led me to think of the white part of fried eggs when I was eating it; I suppose my mother used to put ground pepper on our sunny side-up eggs when I was a kid. Socca was really good. I think Mark would like me to make it at home, but although I probably will try David Lebowitz’s recipe (linked to above) I think it’s one of those things that you’ve really got to get on location. If you go to Nice, it’s a must-try. Oh, Nice. I miss you so. 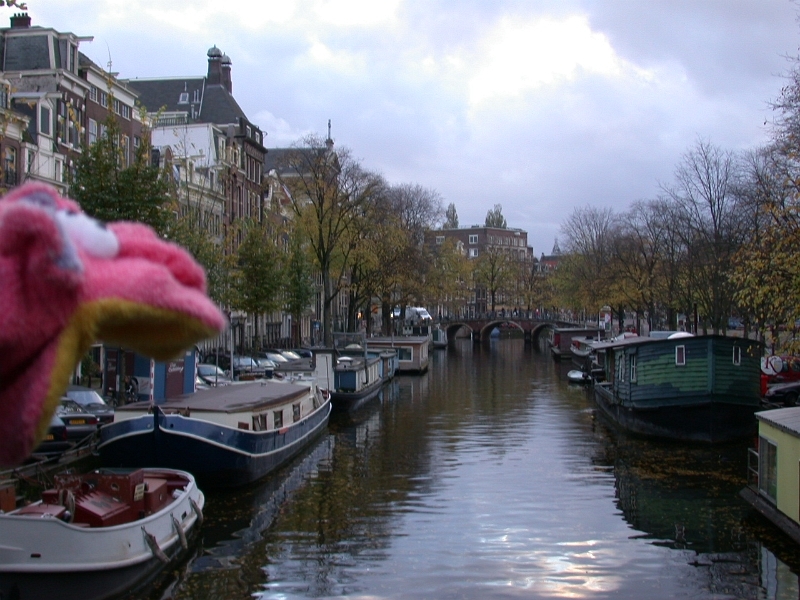 Here’s a teaser for what will be my final vacation post. One day I would like this to be home, not a vacation! I started this post – which isn’t even very long – three days ago and I’m only now finding the time to finish it. What’s more, I ate this dinner a week ago! I’ve always written up and published posts the same day as I’ve eaten the meal in the past. Unfortunately, that’s how busy I’ve been lately. The good news is that after a slump of a couple of months, I’m getting excited about cooking again so you should be seeing more from me. Of course, on the other hand, it’s about to be baby wildlife season which means the small amount of free time I have now is about to go away. But there’s good news there too because baby wildlife season means tons of pictures of baby raccoons – and maybe, JUST MAYBE (cross your fingers! ), baby skunks – to share. Enough blabber. On with the food. One of my favorite Indian dishes is saag, or spinach and mustard greens, but it’s often made with paneer, which is cheese, in restaurants, which means I can’t have it. What’s a girl to do but make it at home, right? Here’s what I did. All the “1/2 tsp”s below? Yeah, I just wrote “1/2 tsp” as a guess. I didn’t really measure any of the spices. Heat some oil in a large pot or skillet (a wok would work well) over medium heat. Add the mustard seeds and stir a bit. When they start to pop, turn the heat down and add the fenugreek and cumin seeds and cook, stirring, until the fenugreek is beginning to brown, then add the turmeric and asofoetida, then the onions, chilis, garlic, and ginger. Cook until the onions are translucent. Add the greens, in batches if you have to, letting some cook down a bit before adding another handful. Add a little bit of water if seems a little dry. Reduce heat, cover, and cook until the greens are soft. Salt to taste. Stir in a dollop of sour cream or yogurt (this is optional but adds a little bit of creamy tang that you’re not getting from the paneer that is so often added to this dish). Here is the saag with some perfectly cooked basmati rice (thank you, rice cooker!). Also served with chana masala and some naan. Yummy and makes for a good lunch the next day or two. For dinner tonight I got the idea to combine sweet potatoes and baby kale. It seemed very autumnal. I gave the internet a half-hearted search for ideas, but didn’t come up with much. Sweet potatoes and kale are not an unheard-of pairing, but a lot of the recipes I came across were soups or stews and I was worried about overwhelming my delicate baby kale. During the search, I did find an intriguing non-kale recipe, however: Smoked Chile Scalloped Sweet Potatoes. The only problem? I think heavy cream is gross. It’s not even the vegan thing, although obviously it’s off limits because of that. Maybe it’s because I was raised on skim milk and I don’t recall ever even having cream of any sort, but I just think heavy cream – especially in a savory recipe – is disgusting. (I also tried whole milk once – before I was vegan, of course, – and almost threw up.) I don’t even want to substitute for it; I just think the idea of putting it or anything that is remotely like it in my food is abhorrent. And heavy cream is a pretty big component of that recipe. Fortunately, my vegan sub doesn’t just make the recipe safe for those who prefer not to eat animal products, it also makes it much healthier and a lot less…gross. I cut this back to serve two as a side dish. If you’re serving more, feel free to double it. Peel and slice the sweet potato about 1/8″ thick. A mandolin is a huge help here as uniform slices will look best and also cook evenly. Whisk together the rest of the ingredients in a small bowl. In a small baking dish, layer a row of slightly overlapping sweet potato slices. Add additional layers until all slices are used up. Pour the “milk” mixture over the sweet potato slices. Cover and bake for 45 minutes or until sweet potatoes are soft. Since I wasn’t putting them together in a single dish, I just simply sauteed the baby kale in a little olive oil with garlic and seasoned with salt and pepper. This was my first time trying baby kale. It’s gorgeous. Baby kale is every bit as awesome as I expected it to be. I didn’t cook the sweet potatoes and baby kale together, but you can be sure I ATE them together. I’m one of those people that happily mushes everything on their plate together – I don’t understand people who have “food touching” issues – but the sweet potatoes and kale were particularly awesome together. Also served with barley pilaf from How to Cook Everything Vegetarian. Mark said the sweet potatoes were great; “surprisingly great”. The surprising part wasn’t that I made something great (I don’t think), it was that the sweet potatoes were spicy. And smoky. Chipotle-y! This was a really good meal. Halloween was a couple of weeks ago, but my friend Dave just sent me this lovely photograph, which he snapped Saturday night. It’s Renae, The Happiest Zombie Ever. And here is a skunk who wants to come in. AND I WANT TO LET HIM IN BECAUSE HE’S AWESOME. But I’m not going to. No, I’m not. I swear. It’s wrong to invite skunks into your home. No matter how awesome they are. Maybe he could just come in for 5 minutes?